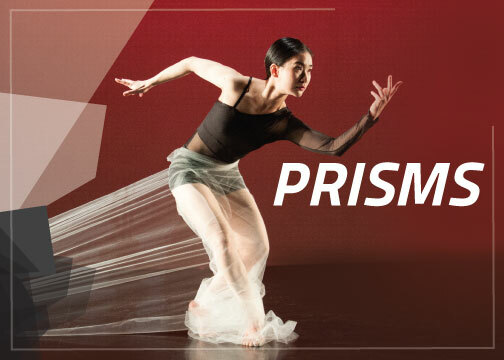 The Case Western Reserve University Department of Dance will continue its 2016-2017 season with Prisms, a thesis concert featuring MFA candidate Tingting Zhou, and guest choreographers and alumni Ziying Cui and Dani Dowler. Performance dates include March 30th, 31st and April 1st at 8pm, and April 2nd at 2:30pm. Concrete Jungle, an ensemble work Zhou premiered in December 2015, reveals a common dilemma often experienced by those living in the city. Individuals seek recognition for their accomplishments; however, their success is quickly swallowed up by the fast-paced and competitive modern society. Zhou will perform Fierce Flame, a solo work set to music by Long Zhou. The work comes from the kinetic inspiration of the costume—a red skirt and a long braid. The solo figure slowly reveals her femininity and untamed wildness during the performance of the work. Also premiering on this concert is Entangled Cave, a duet by Zhou who used her background knowledge of computer science to integrate the use of media technology into the choreography. The dance is choreographed to Bartok’s Music for Strings, Percussion and Celesta, BB 114: III. Adagio. The piece tells the story of an evil creature beguiling a woman for dominance. Performers for this piece are Zhou and first year graduate student Xiaomeng Zhao. Guest choreographer, Ziying Cui completed her MFA in Dance at CWRU in 2016. She is re-staging Rite, a dance which re-imagines an ancient Chinese ritual that had been recorded as Nine Songs by the ancient Chinese poet Qu Yuan around 239-278 BC. Set to music by Matthew Burtner and Nancy Hennings, the dance features graduate dance students as well as undergraduate dance majors. Dani Dowler, who earned her MFA in Dance from CWRU in 2014, will be restaging a quartet titled Sensemaya la culebra to music by Silvestré Revueltas. Dowler’s four female dancers explore energetic, athletic movements, and rhythmic and dynamic variations while drawing on strong inspirations from Revueltas’ music and the Nicolas Guillén poem that inspired it. Tickets are $7 for students with ID, $10 for adults 60+ and CWRU personnel, and $15 for general admission. Reservations are recommended, and may be made by calling (216) 368-5246 or online at dance.case.edu/reservations.